Welcome to the forum! The vegistroke system is the only way to go. The only problem I see is to find the right place for the fill neck. There are a few ways to do it, driverside passenger rear door jam, drivers wheel well, or filler door. Not sure who gets the credit for using the 46 gal diesel tank as the veg tank (golden fuel systems?) but it is the least headache in my opinion. I installed the filler in the wheel well on another excursion (the blurp) and will be redoing it as there are too many downfalls. Folks say the door jam is no good either if there is a spill, it spills into the truck. I'll eventually get around to a build thread for my 6.0l Excursion. But for now, here's where I put mine. Diesel fill is left side, veg is now in the original 46 gal poly tank on the right. I used a new 20 gal diesel tank from an 85 GMC on the driver frame rail behind the transfer case with corresponding fuel pickup ($150 total), 1.5" filler hose to an 1.5"-->1.25" reducer where you see it daylight behind the filler door. The plug is 1.25". I can fill at full speed at the diesel pump and 10 gal/min with my veg pump. If you have the time, a plate that slips behind and uses the 3 holes used for the original filler cap and then accepts the 1.5" hose on the underside from the frame rail d2 tank. 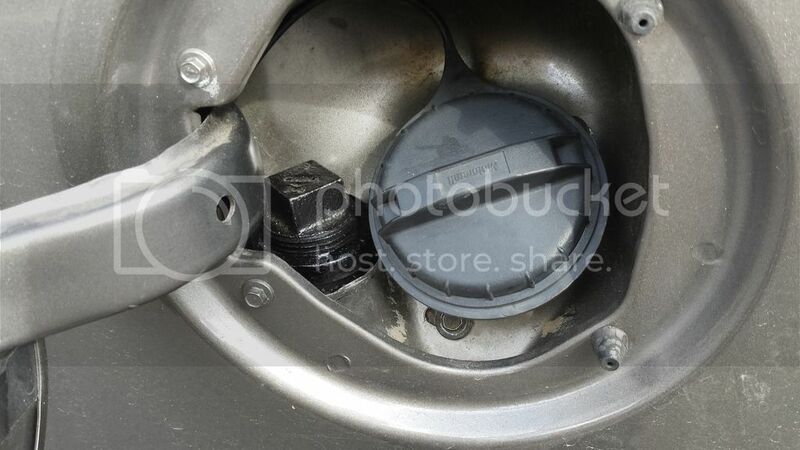 Remove filler cap mount screws, drill hole your 1.5" hole, screw plate in with existing filler cap mount and attach the hose on the underside. Last edited by MtnOilRig; 03-25-2016 at 10:16 PM. I realize that no matter where you go in the world it's the same amount of cubic inches per liter. But manufacturers put badging on vehicles for different reasons and they average numbers . a 6.7 Dodge Cummins is not the same exact cubic inches or cubic centimeters as a 6.7 Ford psd. There's many more examples including the Hemi 5.7 and the 5.7 350 small block Chevrolet. I don't know how things are in Spain. I'm just saying it is possible.